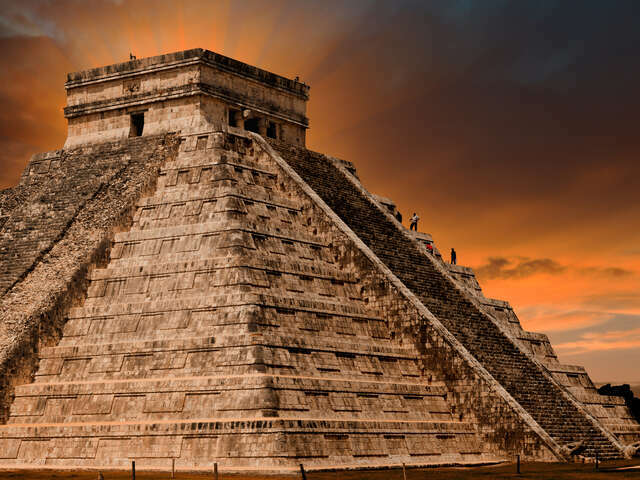 When visiting Mexico, and in particular the Yucatan Peninsula, you will likely have the opportunity to explore some Mayan ruins. Taking a tour is a great way to learn more about what you are seeing and about Mayan history. Health and medicine among the ancient Maya was a complex blend of mind, body, religion, ritual, and science. Important to all, medicine was practiced only by a select few who were given an excellent education. These men, called shamans, act as a medium between the physical world and spirit world. They practice sorcery for the purpose of healing, foresight, and control over natural events. Since medicine was so closely related to religion and sorcery, it was essential that Maya shamans had vast medical knowledge and skill. It is known that the Maya sutured wounds with human hair, reduced fractures, and were even skilled dental surgeons, making prostheses from jade and turquoise and filling teeth with iron pyrite. It is a rather well known fact that the Mayans practiced human sacrifice for religious and medical reasons – but what most people don’t know is that many Mayans still practice blood sacrifice. But don’t get too excited – chicken blood has now replaced human blood. Today the Maya keep many of the ritualistic traditions of their ancestors. Elements of prayer, offerings, blood sacrifice (replacing human blood with that of sacrificed chickens), burning of copal incense, dancing, feasting, and ritual drinking continue in traditional ceremonies. The Mayan peoples regularly used hallucinogenic drugs (taken from the natural world) in their religious rituals, but they also used them in day to day life as painkillers. Flora such as peyote, the morning glory, certain mushrooms, tobacco, and plants used to make alcoholic substances, were commonly used. In addition, as depicted in Maya pottery and carvings, ritual enemas were used for a more rapid absorption and effect of the substance. An important purification element to the ancient Maya was the sweat bath, or zumpul-ché. Similar to a modern day sauna, sweat baths were constructed of stone walls and ceilings, with a small opening in the top of the ceiling. Water poured onto the hot rocks in the room created steam, offering a setting in which to sweat out impurities. Sweat baths were used for a range of conditions and situations. New mothers who had recently conceived a child would seek revitalization in them, while individuals who were sick could find healing power in sweating. Maya kings made a habit out of visiting the sweat baths as well because it left them feeling refreshed and, as they believed, cleaner. For reasons that are still debated, the Maya centers of the southern lowlands went into decline during the 8th and 9th centuries and were abandoned shortly thereafter. This decline was coupled with a cessation of monumental inscriptions and large-scale architectural construction. Non-ecological theories of Maya decline are divided into several subcategories, such as overpopulation, foreign invasion, peasant revolt, and the collapse of key trade routes. Ecological hypotheses include environmental disaster, epidemic disease, and climate change. There is evidence that the Maya population exceeded carrying capacity of the environment including exhaustion of agricultural potential and over-hunting of megafauna. Some scholars have recently theorized that an intense 200 year drought led to the collapse of Maya civilization. Go discover it for yourself and decide why you really think the Mayan civilization disappeared.